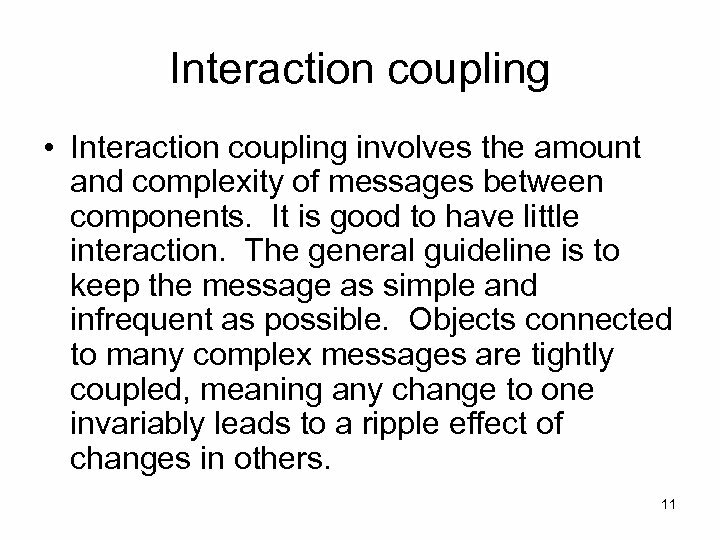 Cohesion • Cohesion: The interactions within a single object or software component is called cohesion. 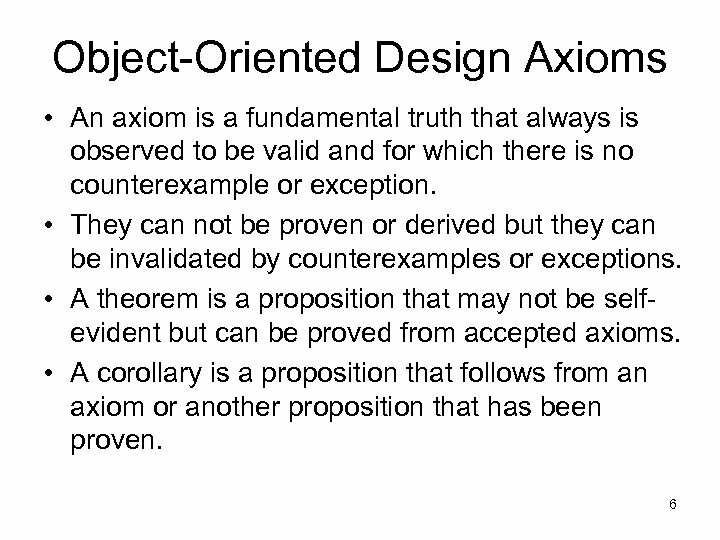 • Cohesion reflects the “single-purposeness” of an object. 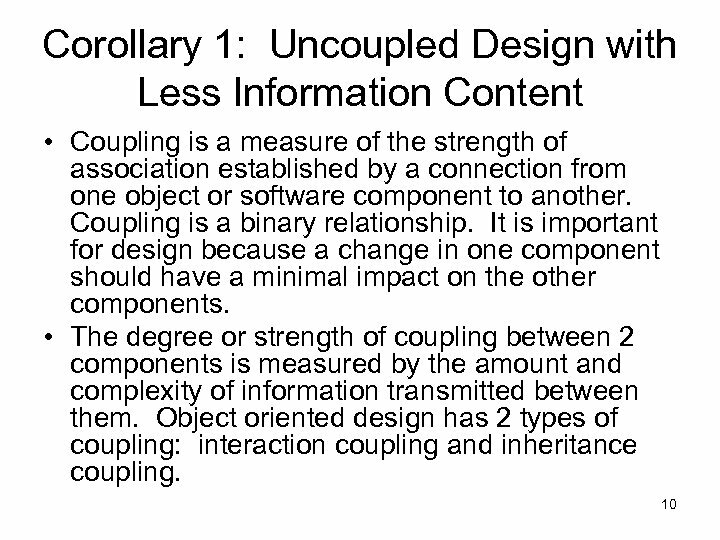 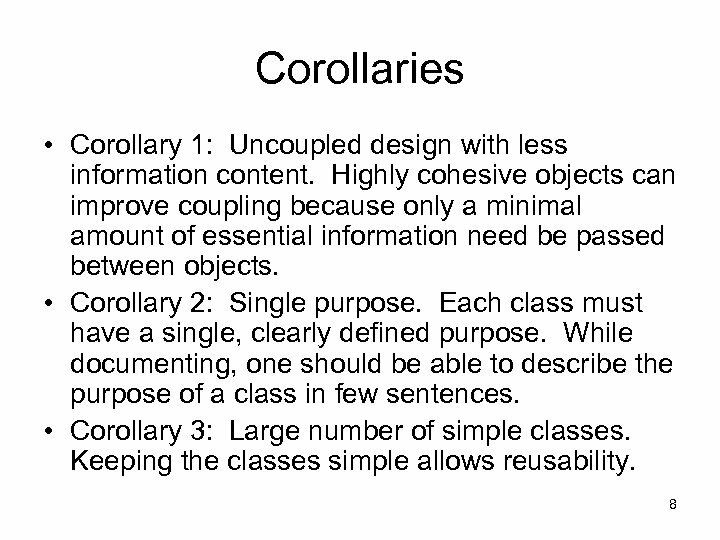 • Highly cohesive components can lower coupling because only a minimum of essential information need be passed between components. 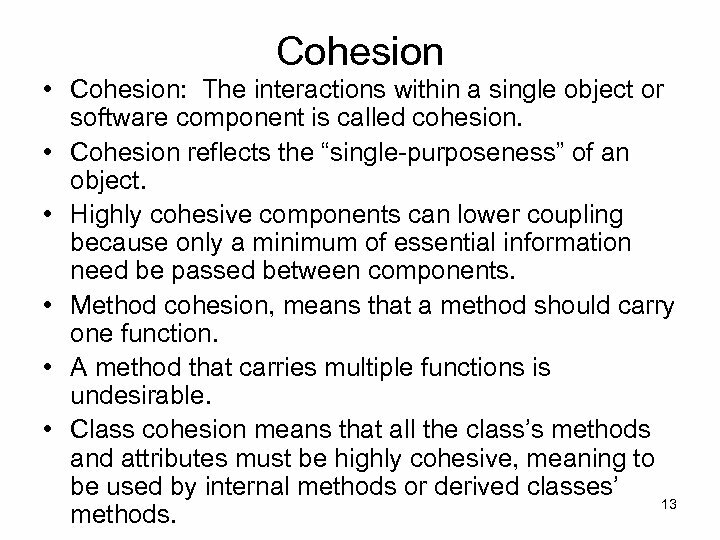 • Method cohesion, means that a method should carry one function. 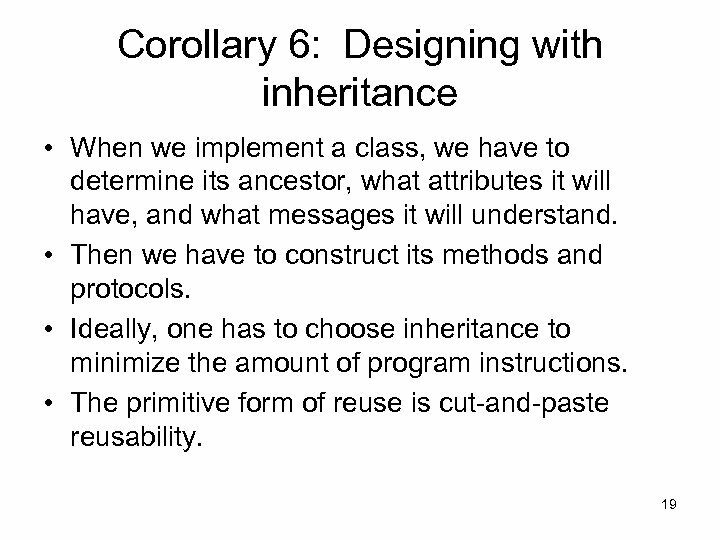 • A method that carries multiple functions is undesirable. 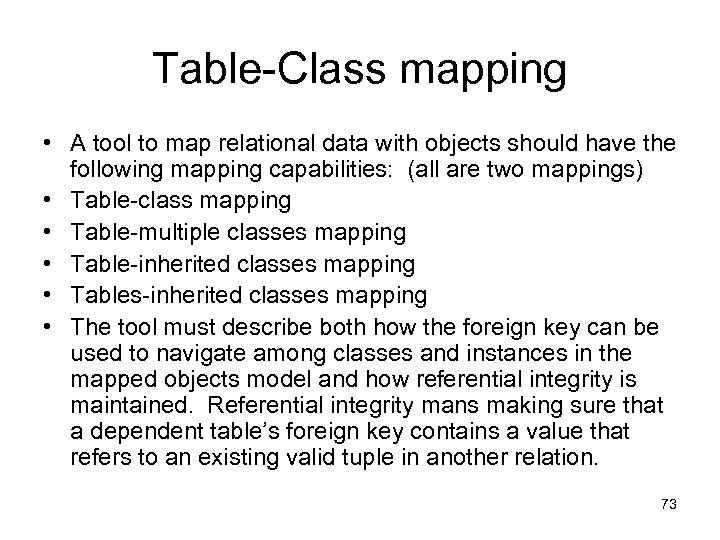 • Class cohesion means that all the class’s methods and attributes must be highly cohesive, meaning to be used by internal methods or derived classes’ 13 methods. 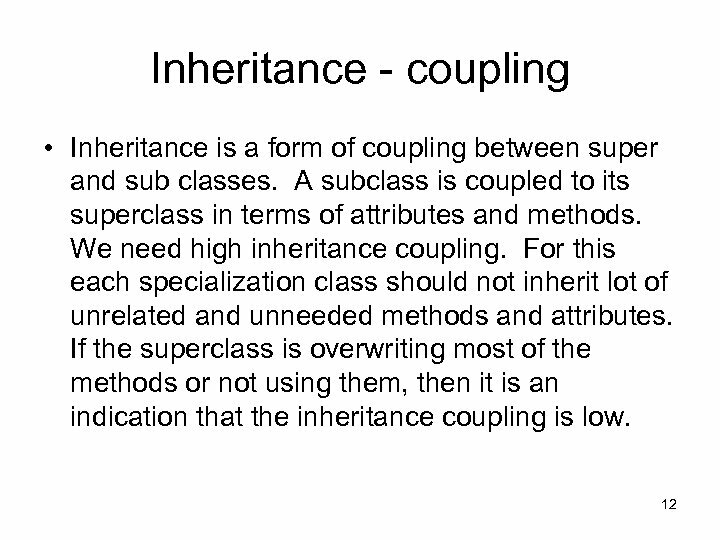 Achieving Multiple Inheritance in a Singe Inheritance System • Single inheritance means that each class has only a single super class. 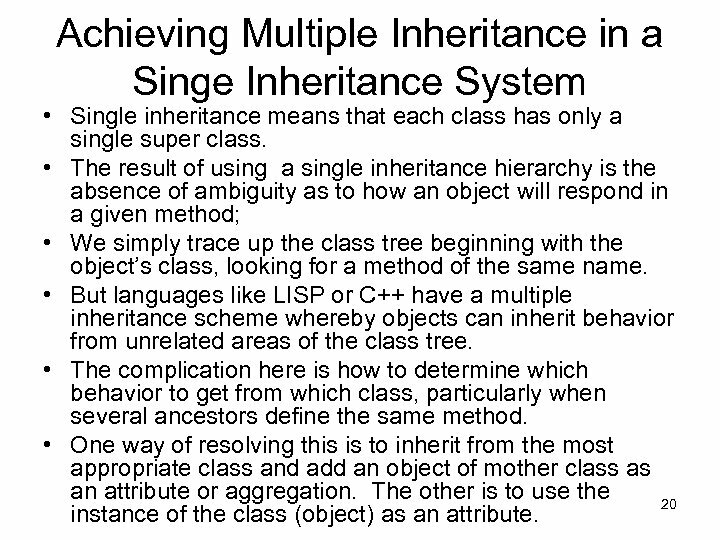 • The result of using a single inheritance hierarchy is the absence of ambiguity as to how an object will respond in a given method; • We simply trace up the class tree beginning with the object’s class, looking for a method of the same name. 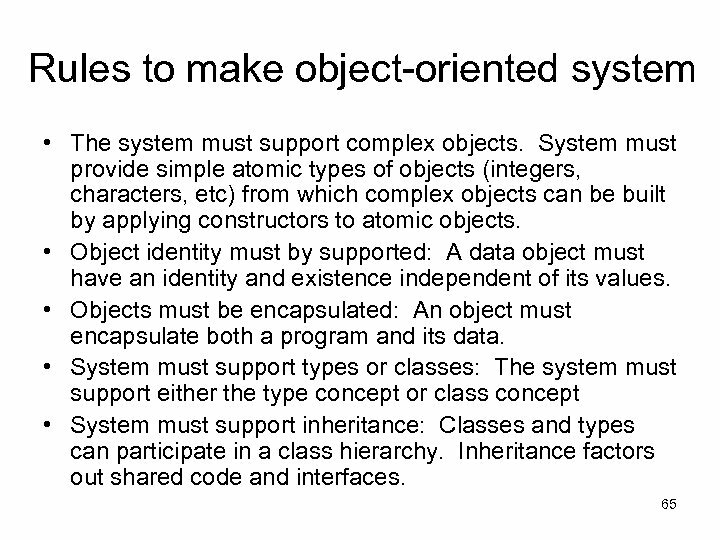 • But languages like LISP or C++ have a multiple inheritance scheme whereby objects can inherit behavior from unrelated areas of the class tree. 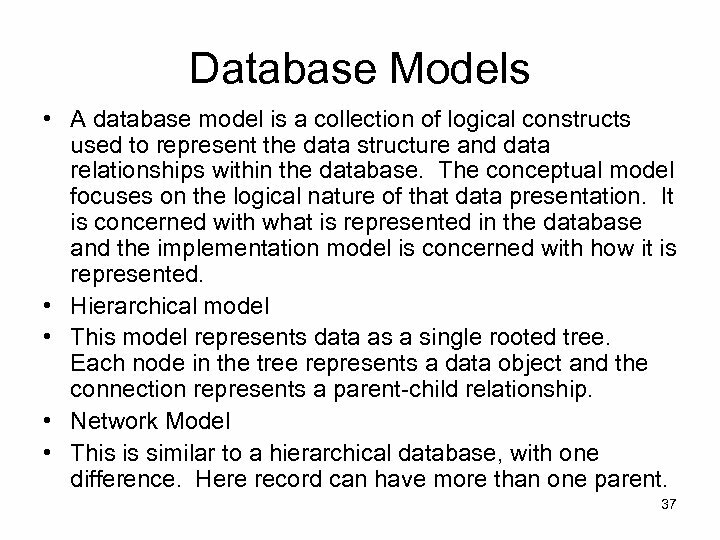 • The complication here is how to determine which behavior to get from which class, particularly when several ancestors define the same method. 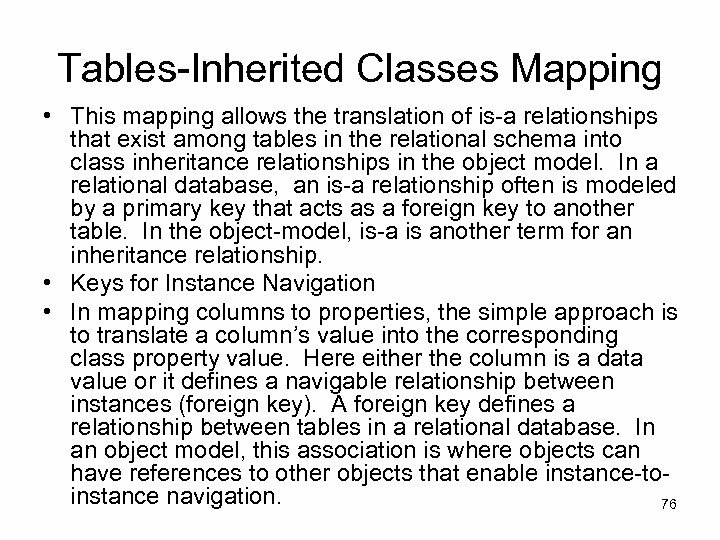 • One way of resolving this is to inherit from the most appropriate class and add an object of mother class as an attribute or aggregation. 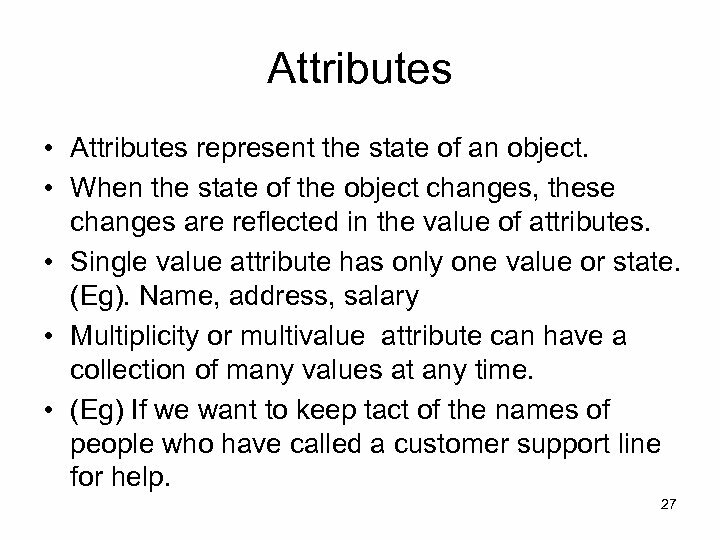 The other is to use the 20 instance of the class (object) as an attribute. 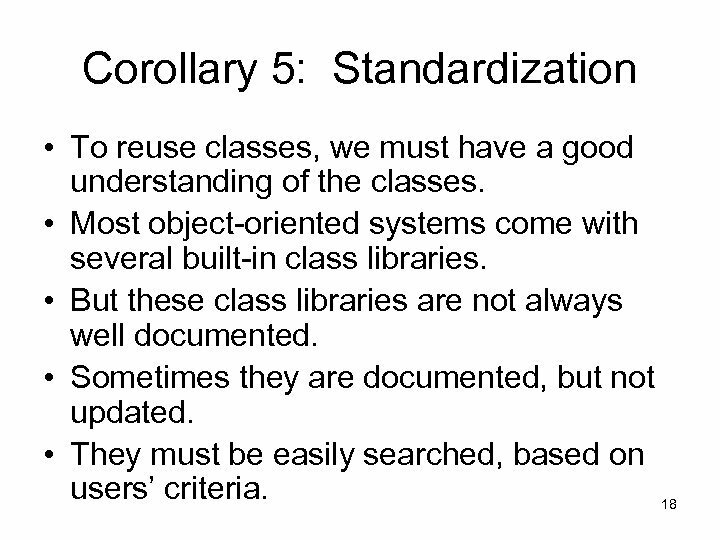 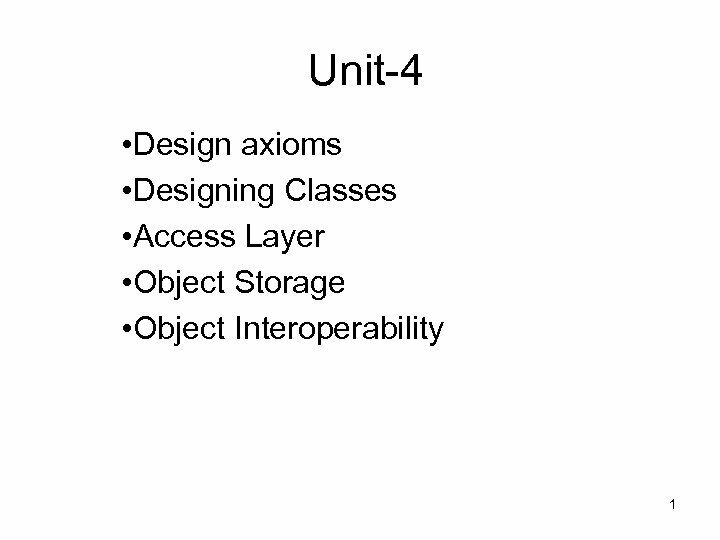 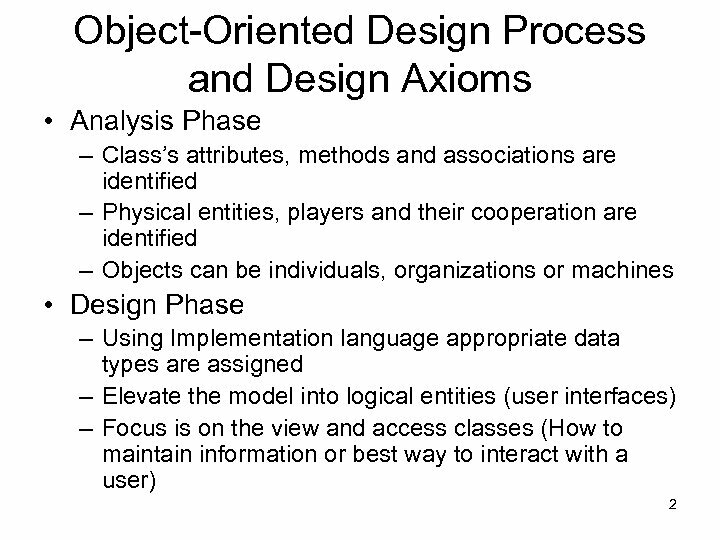 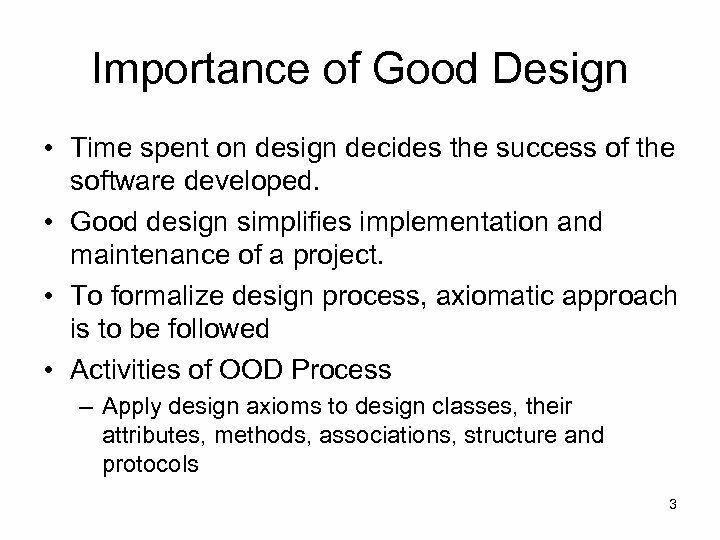 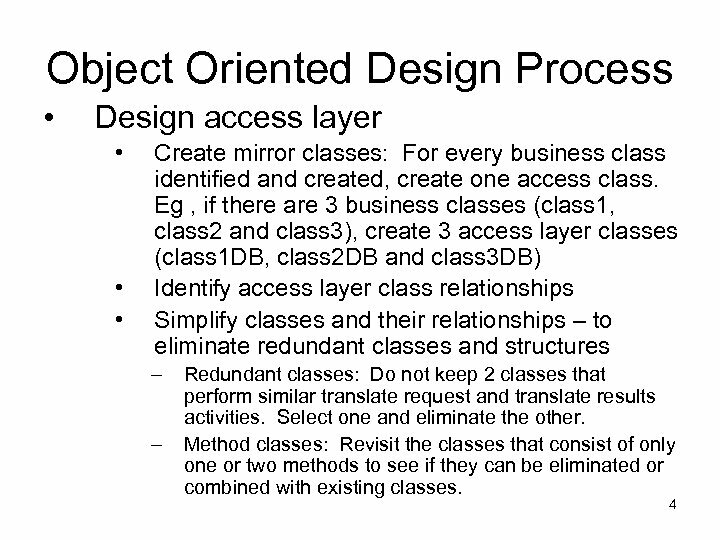 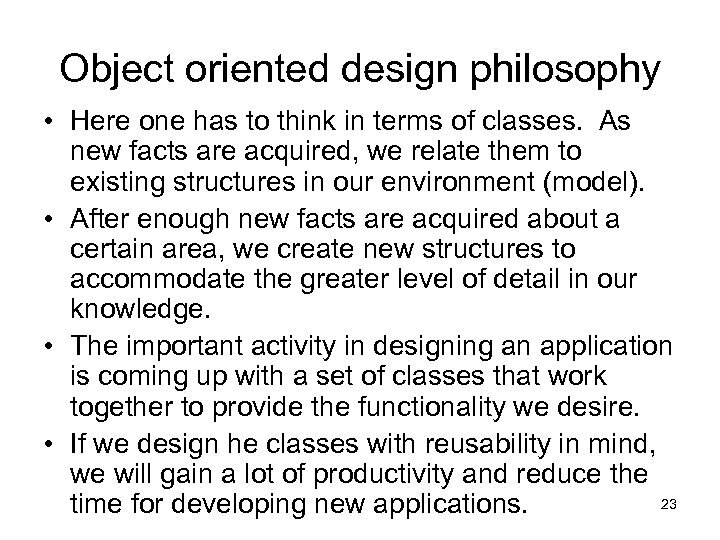 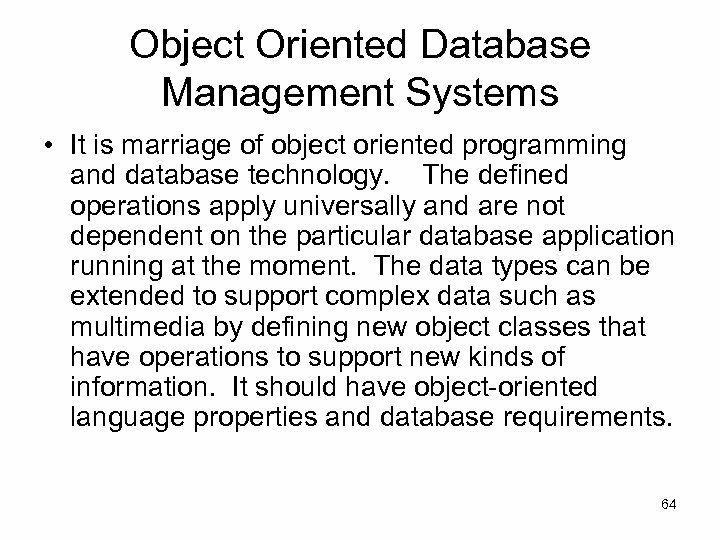 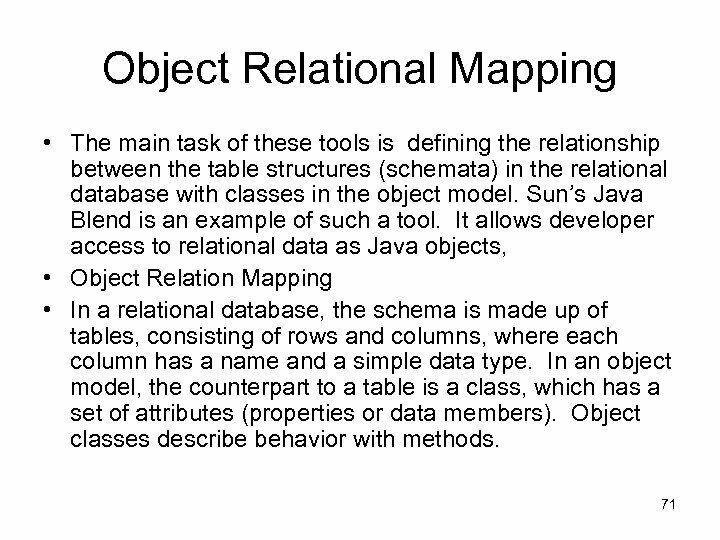 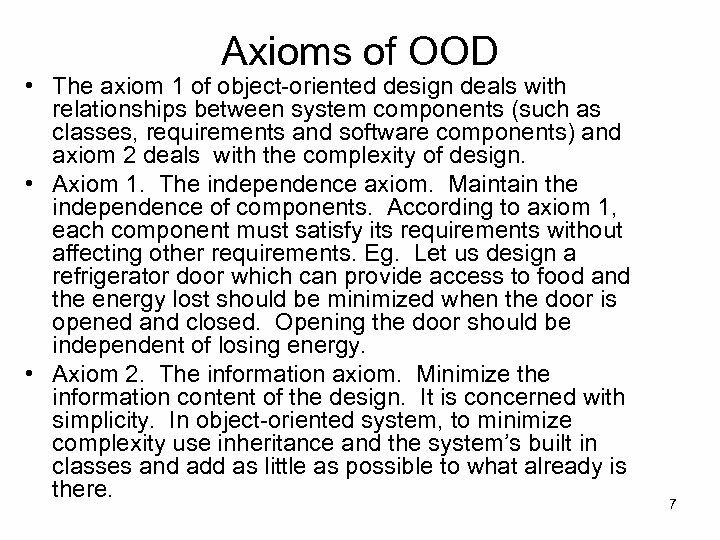 Object oriented design philosophy • Here one has to think in terms of classes. 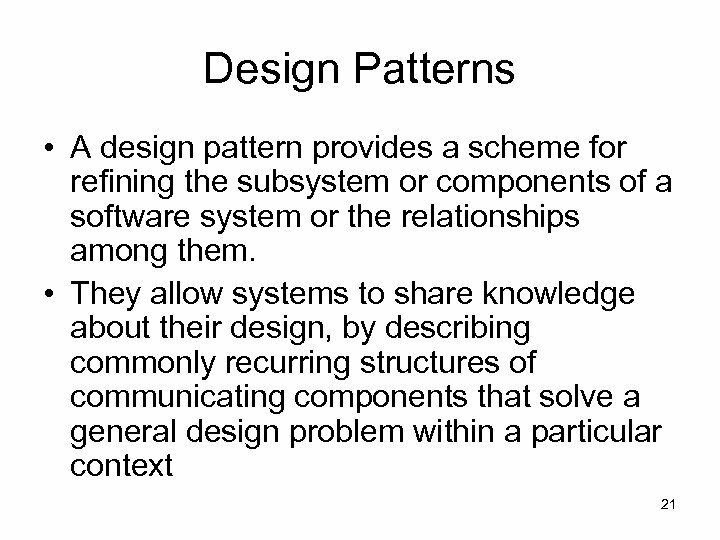 As new facts are acquired, we relate them to existing structures in our environment (model). 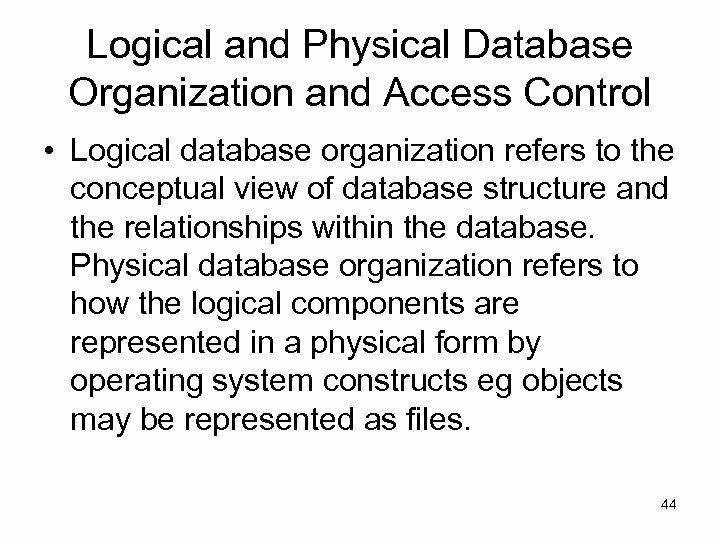 • After enough new facts are acquired about a certain area, we create new structures to accommodate the greater level of detail in our knowledge. 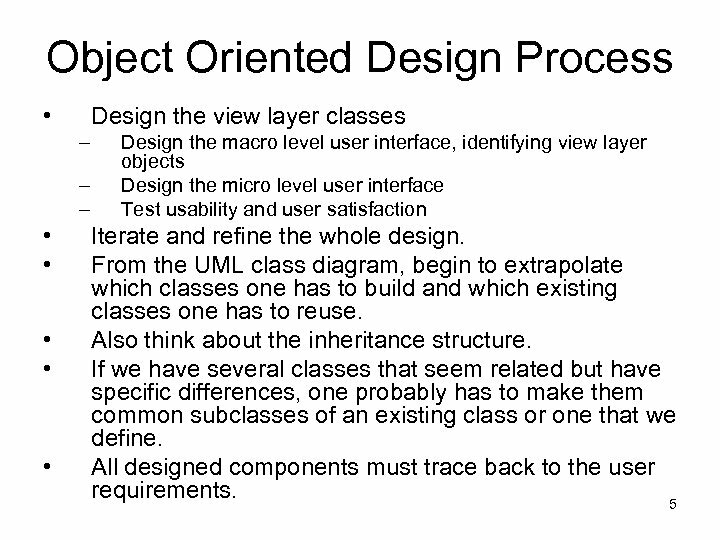 • The important activity in designing an application is coming up with a set of classes that work together to provide the functionality we desire. 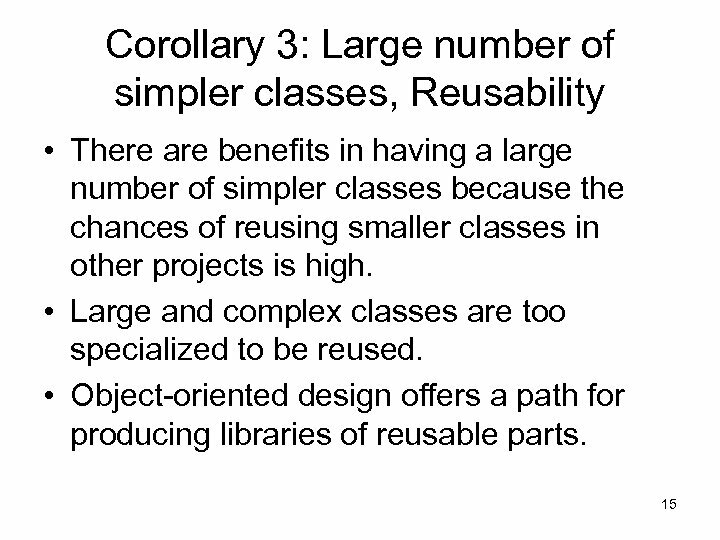 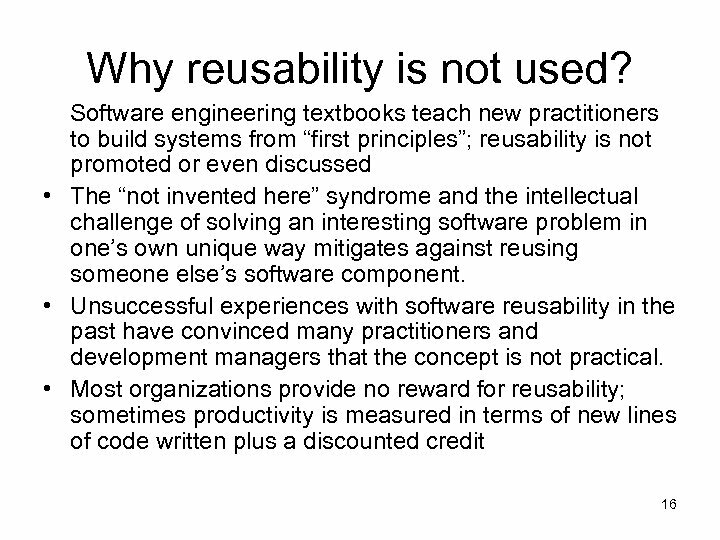 • If we design he classes with reusability in mind, we will gain a lot of productivity and reduce the 23 time for developing new applications. 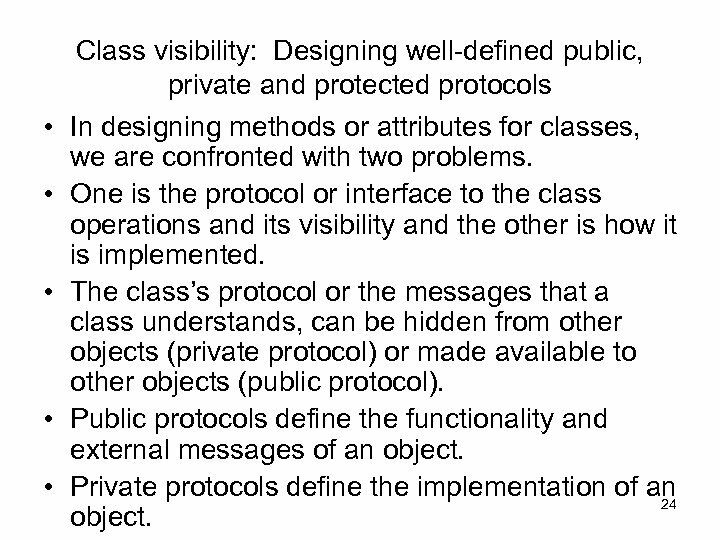 Class visibility: Designing well-defined public, private and protected protocols • In designing methods or attributes for classes, we are confronted with two problems. 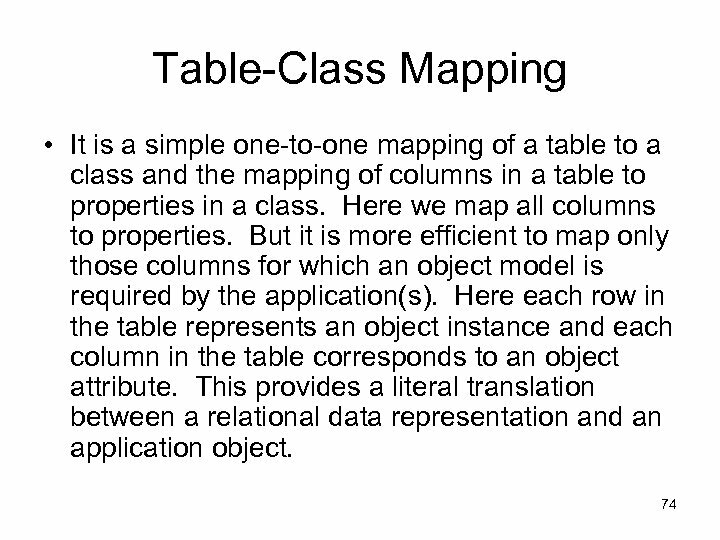 • One is the protocol or interface to the class operations and its visibility and the other is how it is implemented. 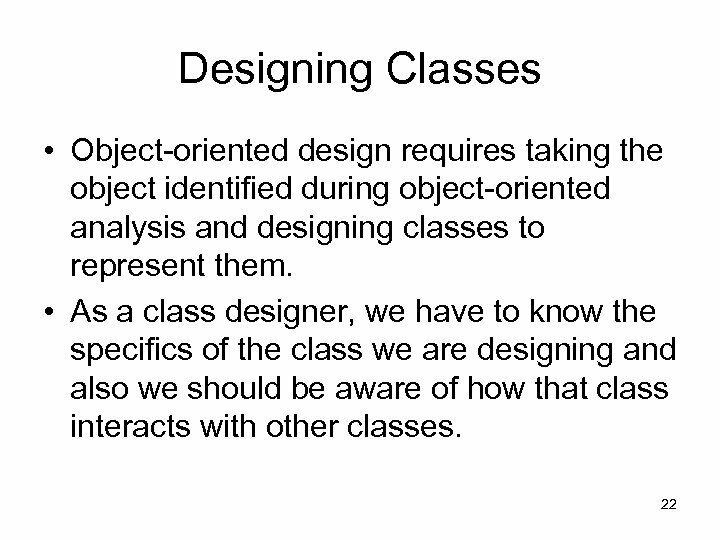 • The class’s protocol or the messages that a class understands, can be hidden from other objects (private protocol) or made available to other objects (public protocol). 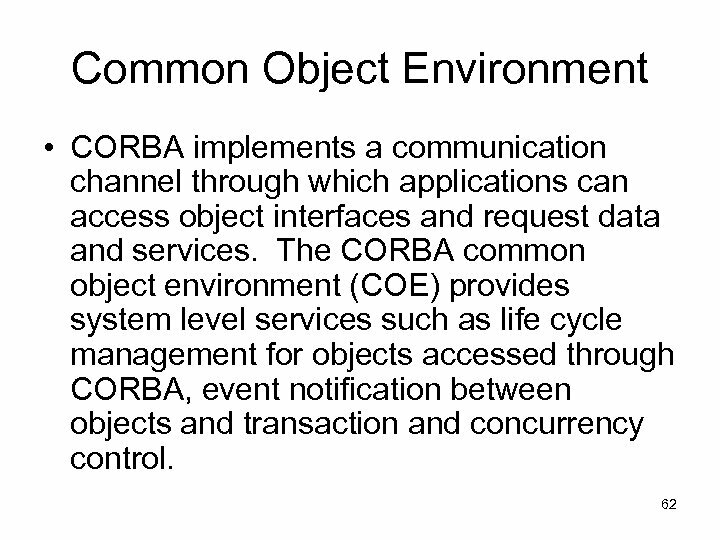 • Public protocols define the functionality and external messages of an object. 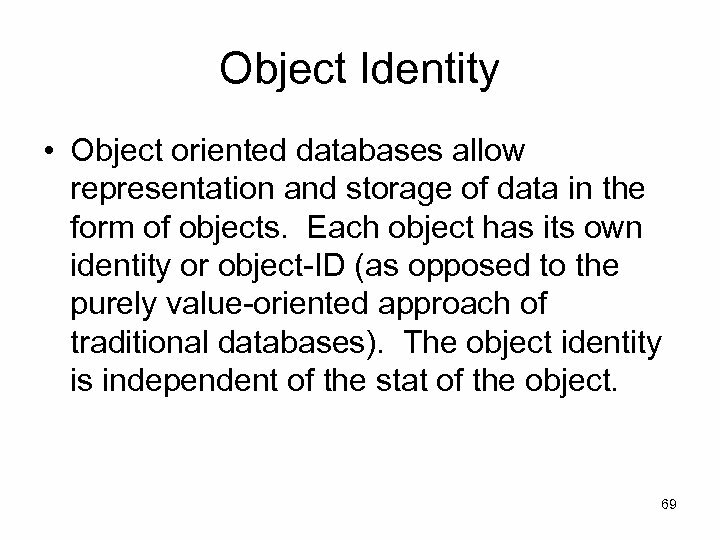 • Private protocols define the implementation of an 24 object. 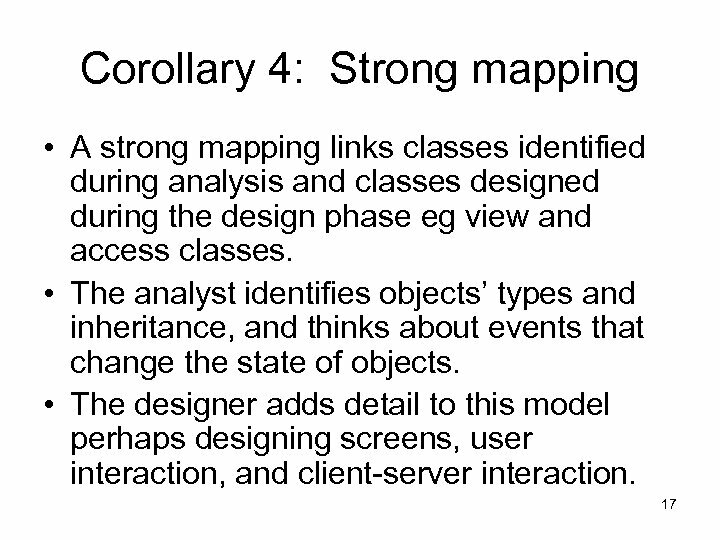 Visibility • A class might have a set of methods that it uses only internally, messages to itself. 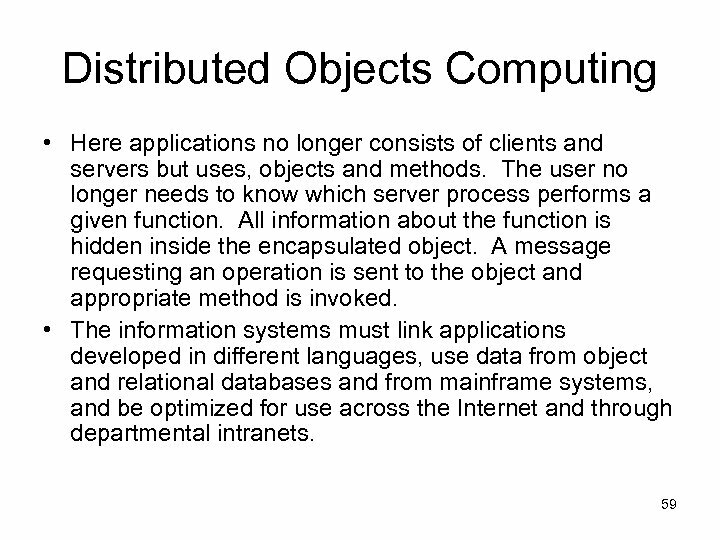 This private protocol of the class, includes messages that normally should not be sent from other objects. 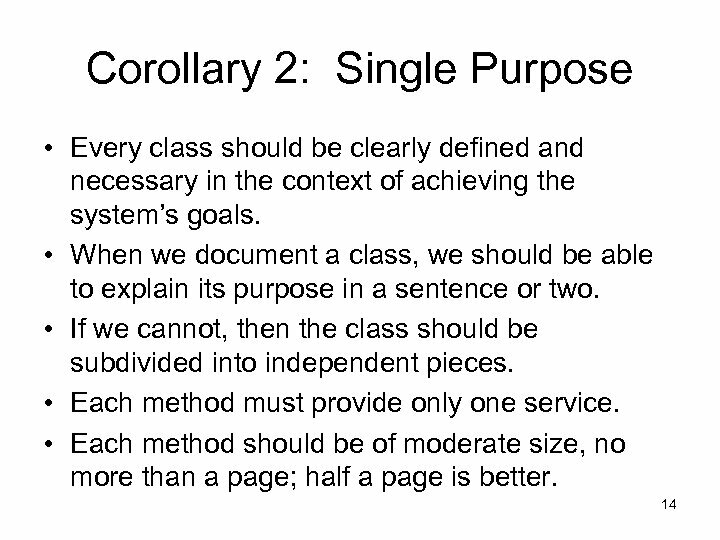 Here only the class itself can use the methods. 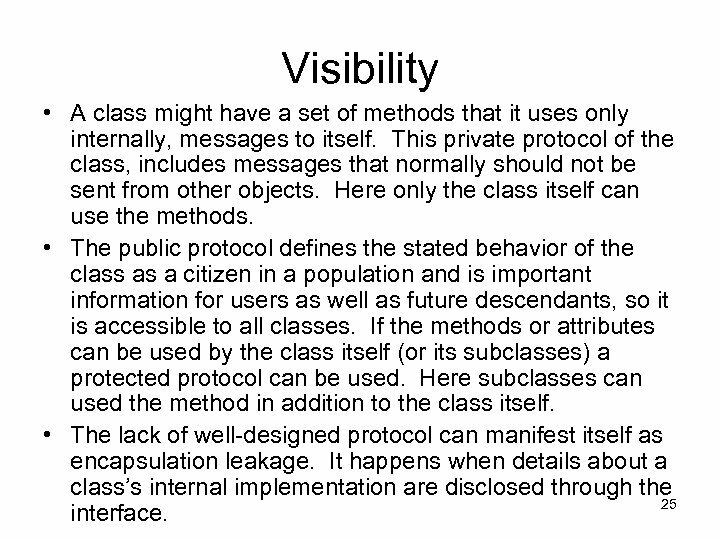 • The public protocol defines the stated behavior of the class as a citizen in a population and is important information for users as well as future descendants, so it is accessible to all classes. 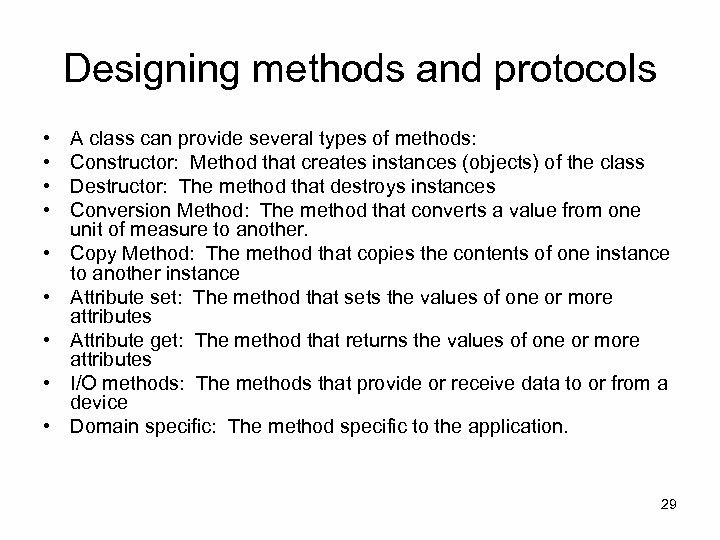 If the methods or attributes can be used by the class itself (or its subclasses) a protected protocol can be used. 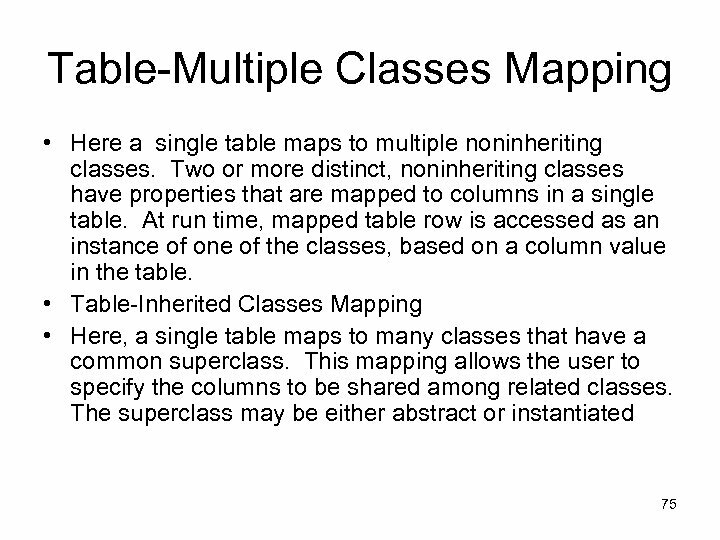 Here subclasses can used the method in addition to the class itself. 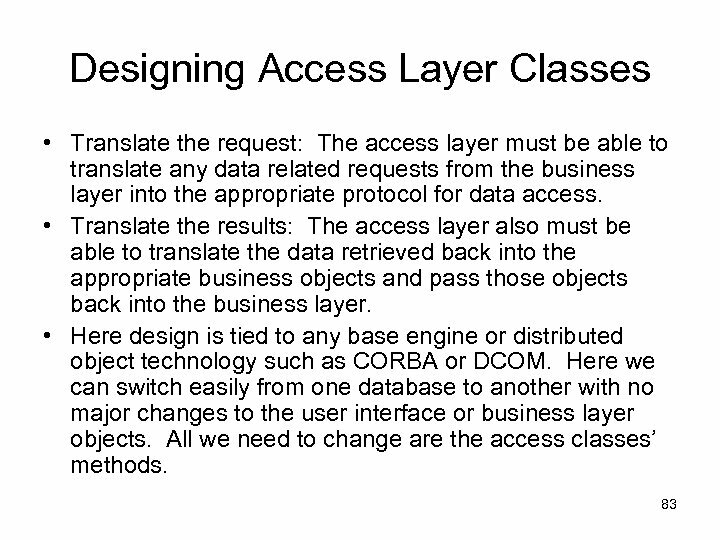 • The lack of well-designed protocol can manifest itself as encapsulation leakage. 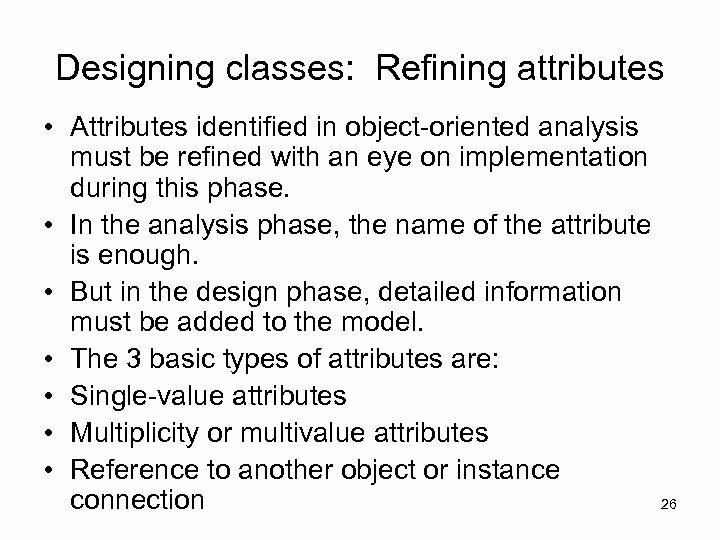 It happens when details about a class’s internal implementation are disclosed through the 25 interface. 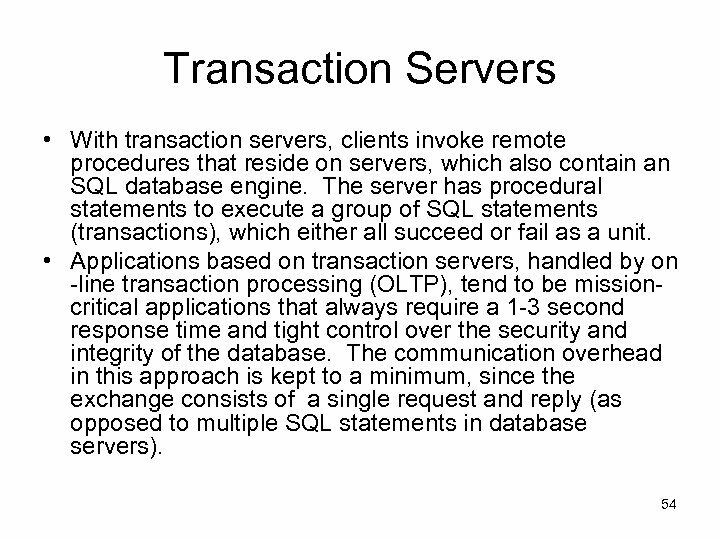 Transactions • Transaction is a unit of change in which many individual modifications are aggregated into a single modification that occurs in its entirety or not at all. 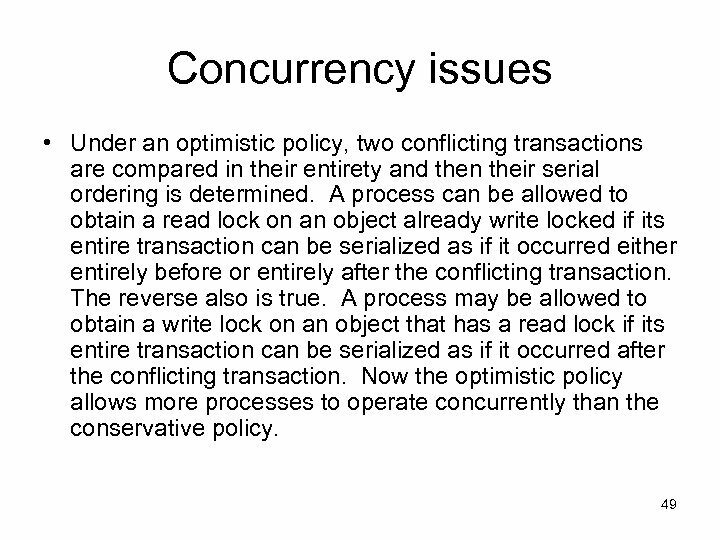 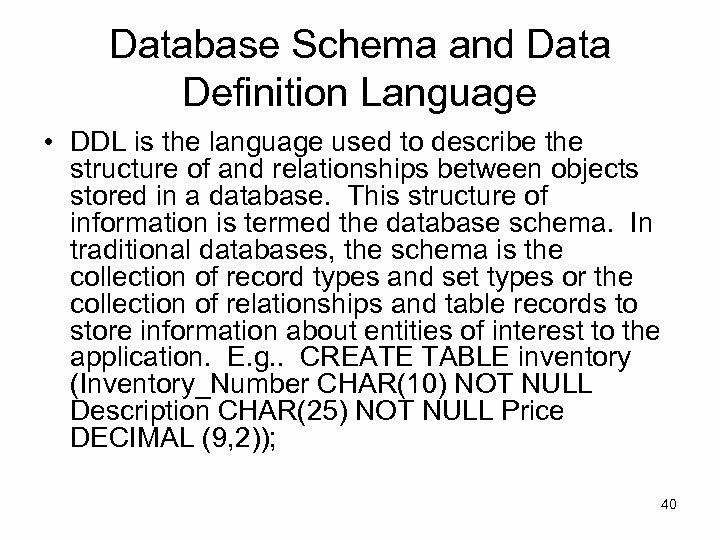 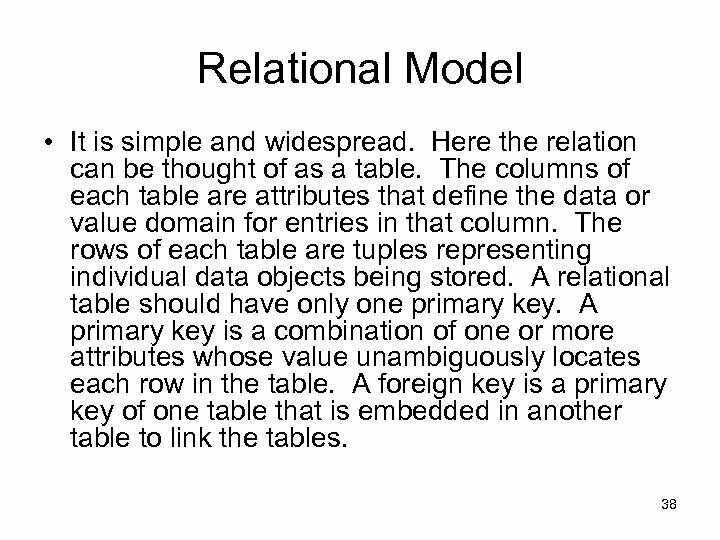 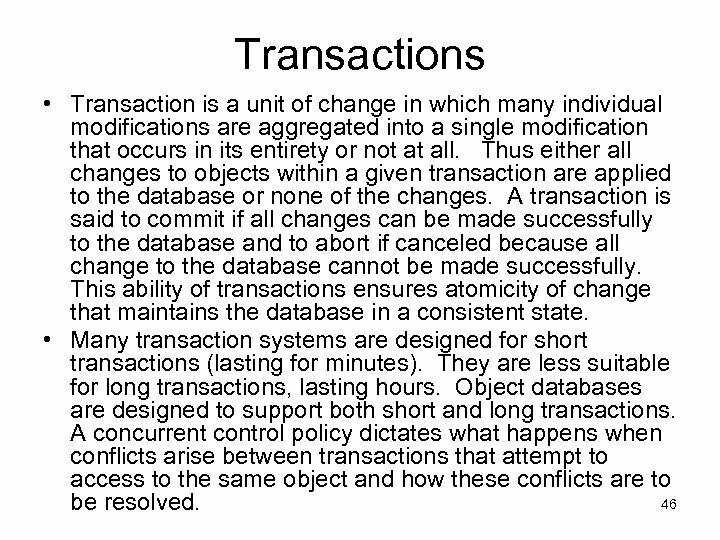 Thus either all changes to objects within a given transaction are applied to the database or none of the changes. 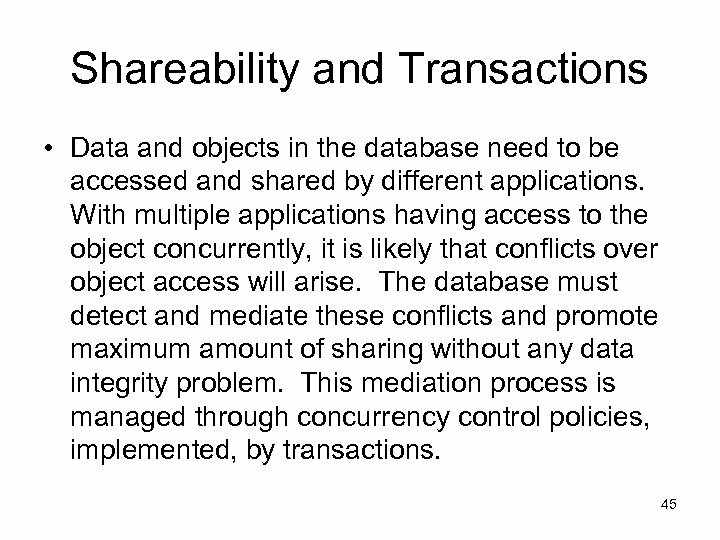 A transaction is said to commit if all changes can be made successfully to the database and to abort if canceled because all change to the database cannot be made successfully. 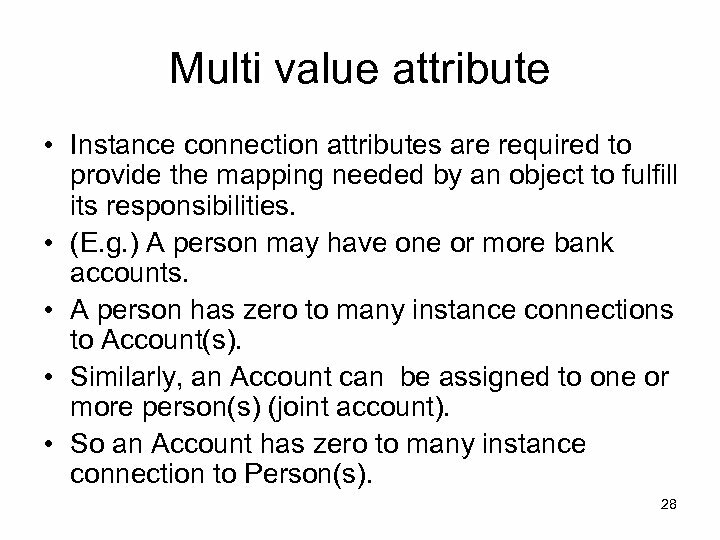 This ability of transactions ensures atomicity of change that maintains the database in a consistent state. 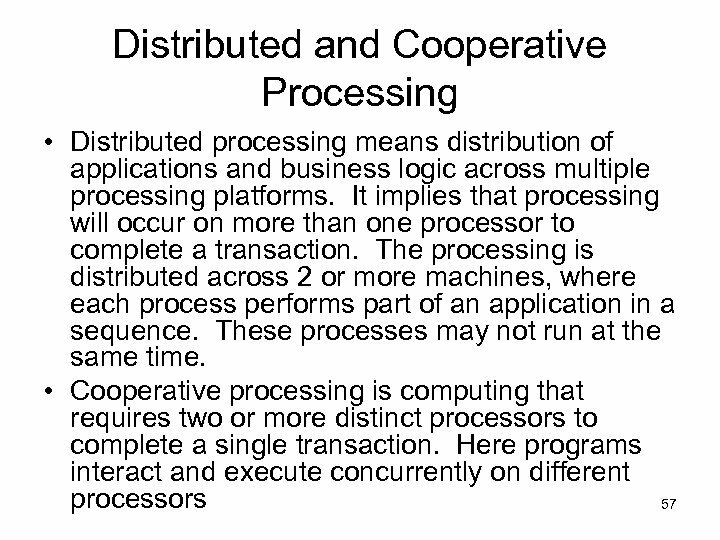 • Many transaction systems are designed for short transactions (lasting for minutes). 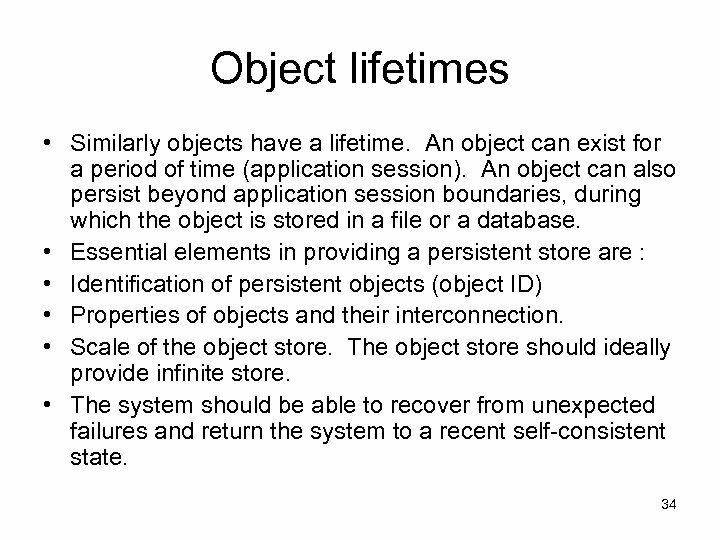 They are less suitable for long transactions, lasting hours. 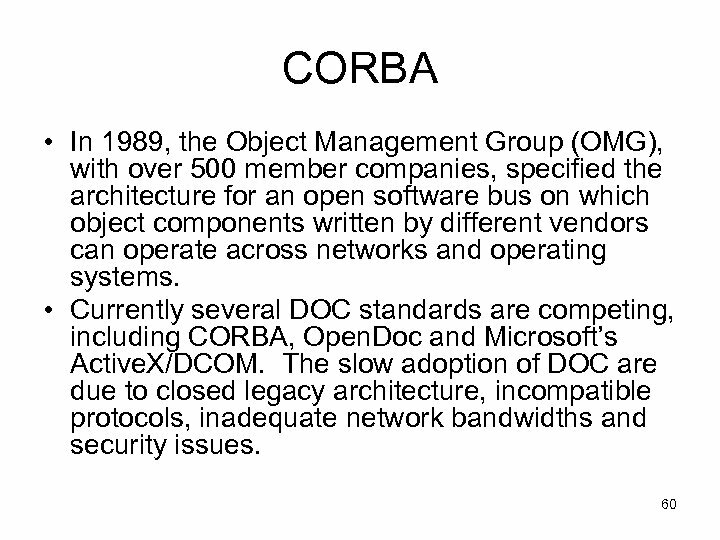 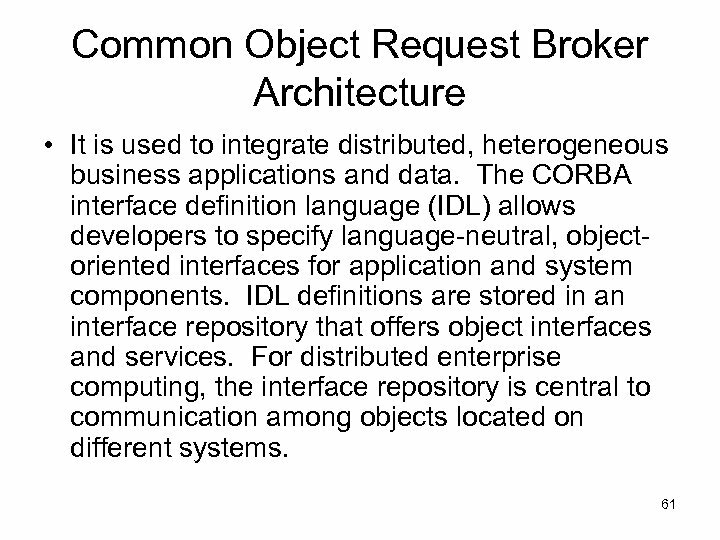 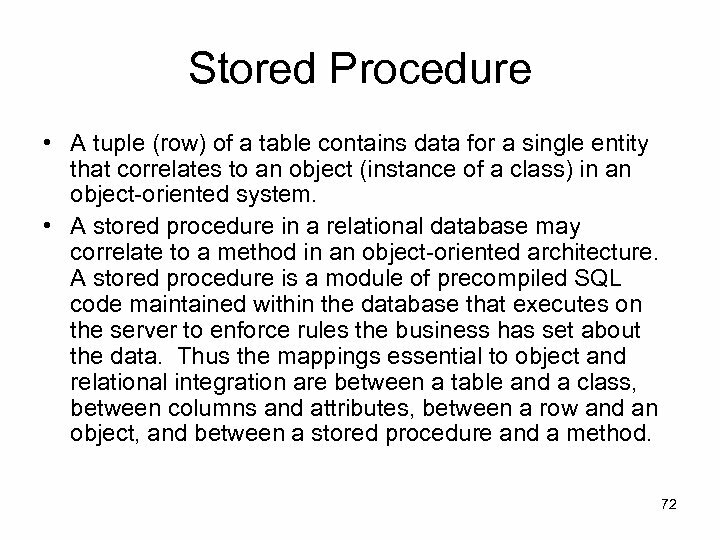 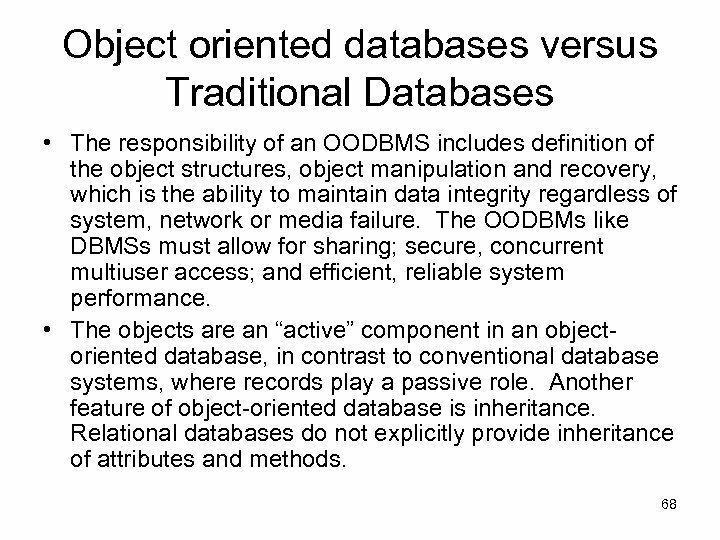 Object databases are designed to support both short and long transactions. 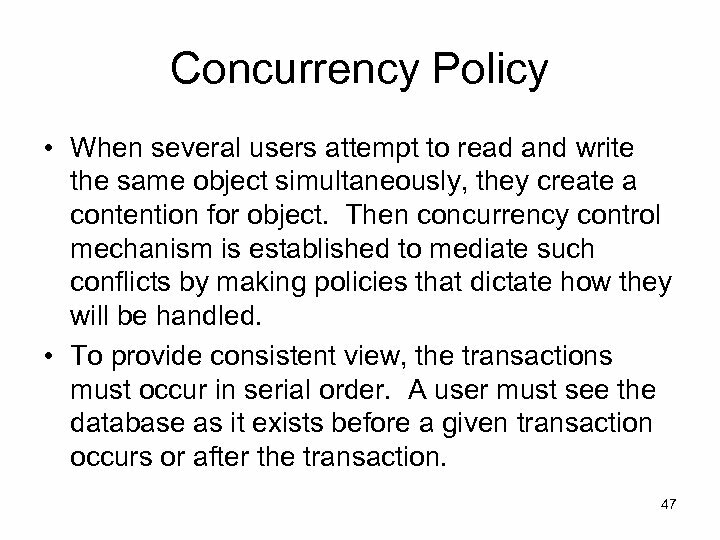 A concurrent control policy dictates what happens when conflicts arise between transactions that attempt to access to the same object and how these conflicts are to 46 be resolved. 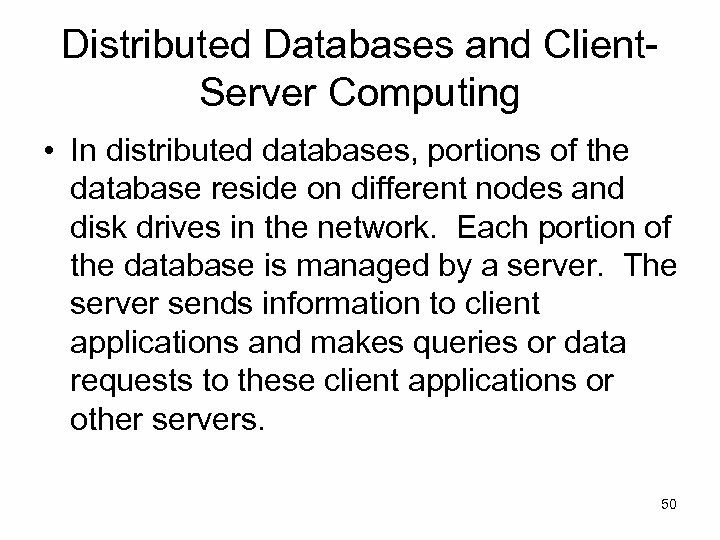 Client-Server Computing • It is the logical extension of modular programming. 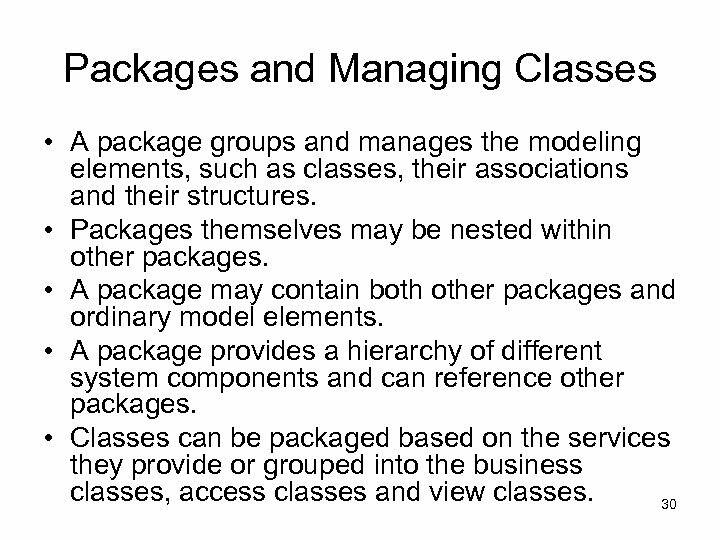 In modular programming we separate a large piece of software into its constituent parts (modules). 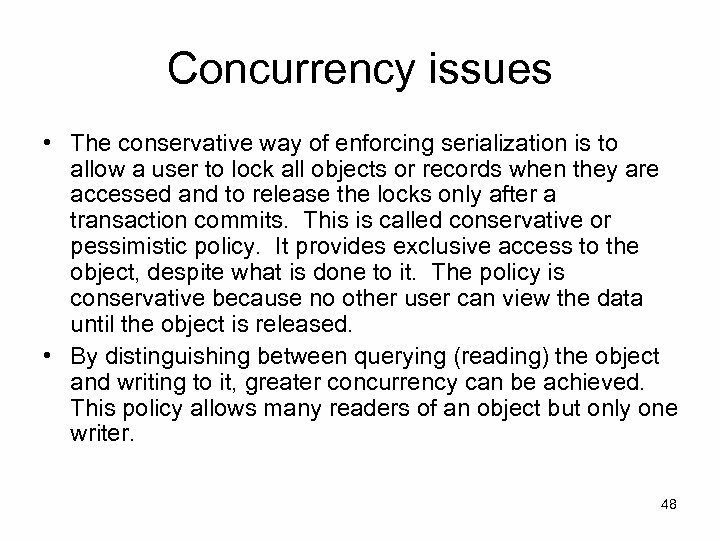 This makes development easier and gives better maintainability. 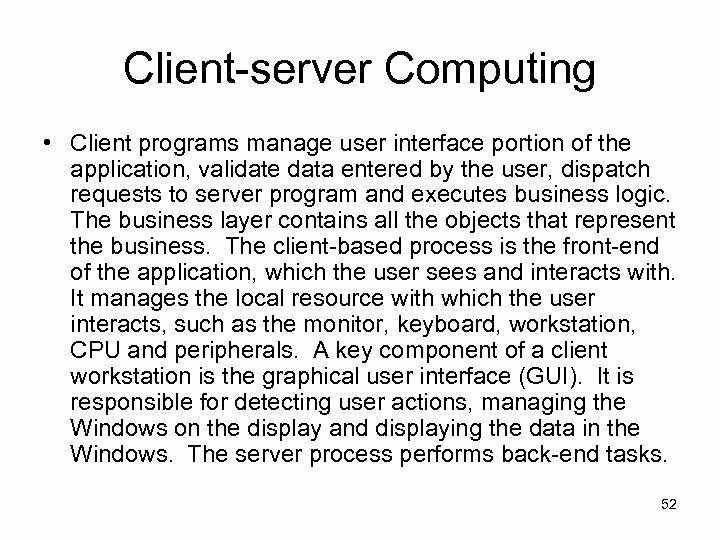 • In client-server computing all those modules are not executed within the same memory space or even on the same machine. 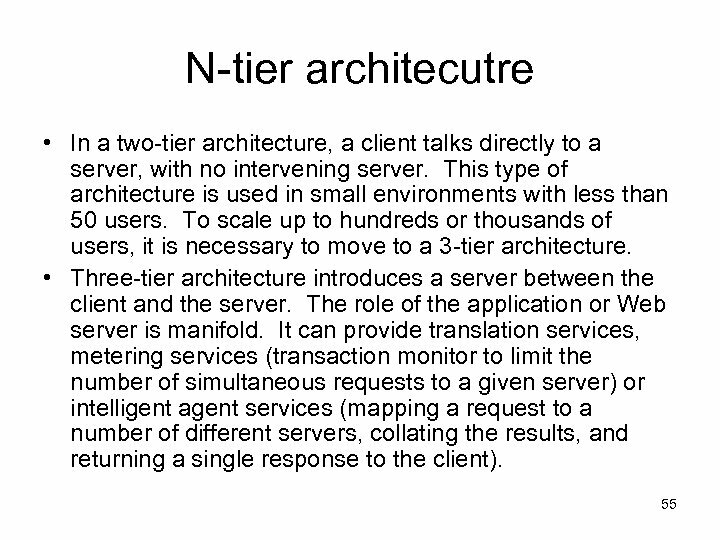 Here the calling method becomes “client” and the called module becomes the “server”. 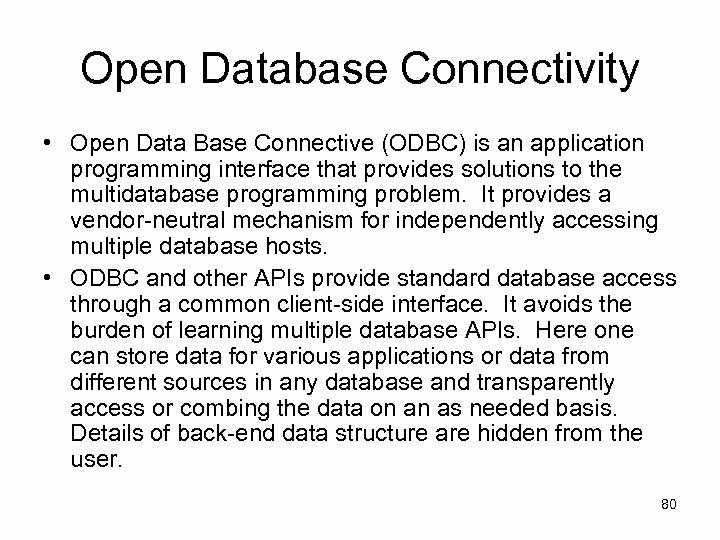 The important component of client-server computing is connectivity, which allows applications to communicate transparently with other programs or processes, regardless of their locations. 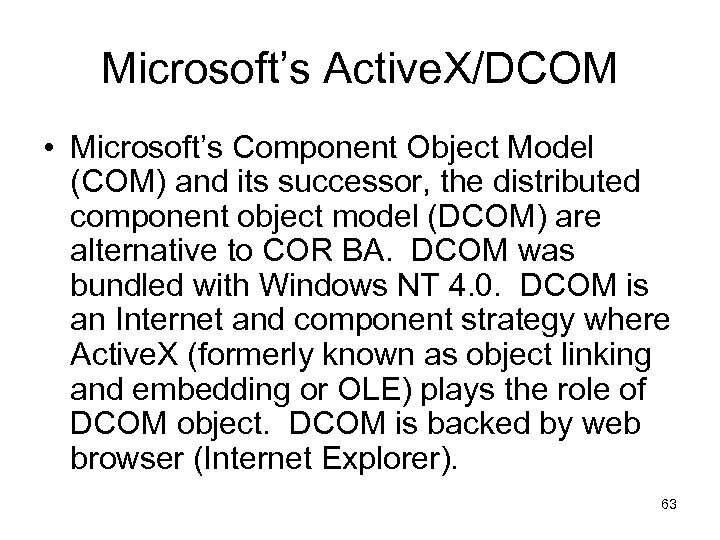 The key element of connectivity is the network operating system (NOS), known as middleware. 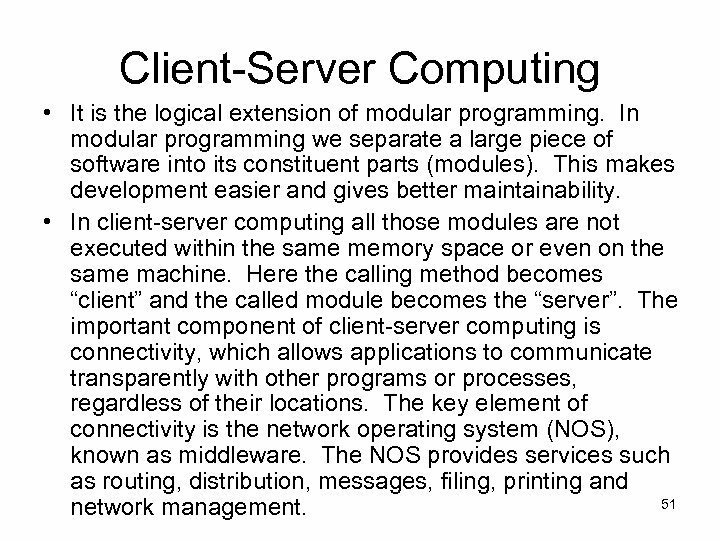 The NOS provides services such as routing, distribution, messages, filing, printing and 51 network management. 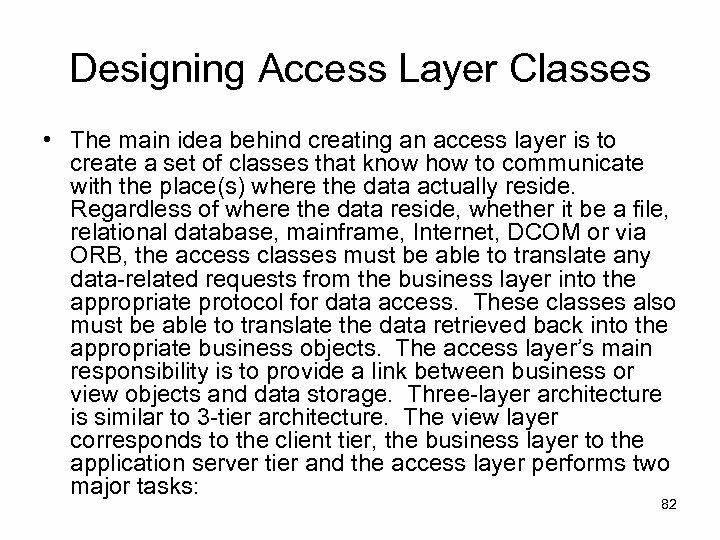 Basic characteristics of clientserver architectures • The client process contains solution-specific logic and provides the interface between the user and the rest of the application system. 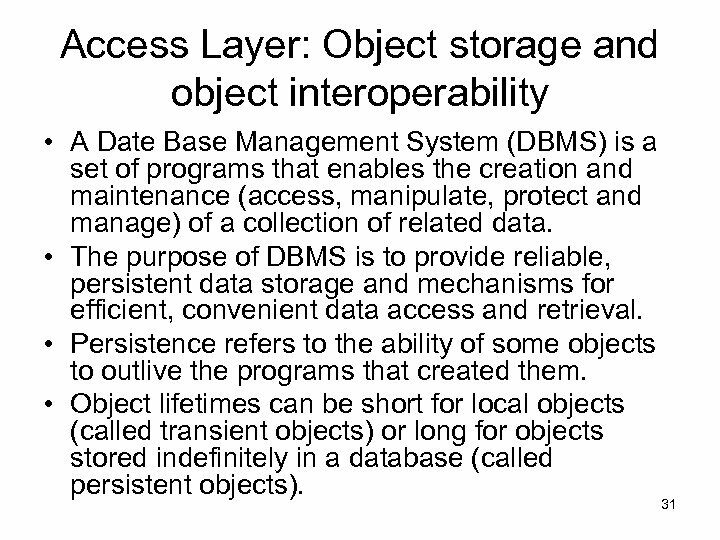 The server process acts as a software engine that manages shared resources such as databases, printers, modems or processors. 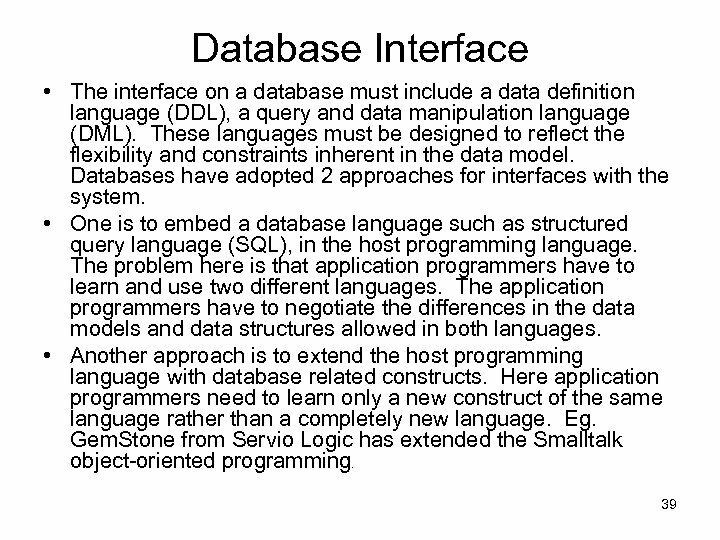 • The front end task and back-end task have fundamentally different requirements for computing resources such as processor speeds, memory, disk speeds and capacities and i/o devices. 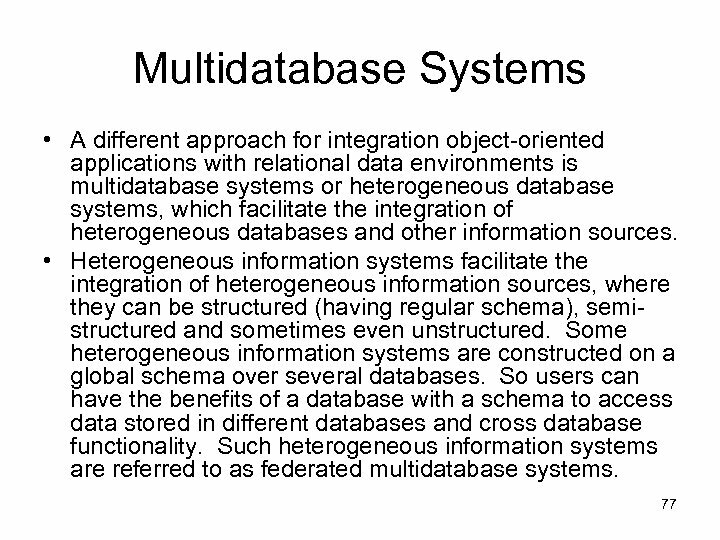 • The environment is heterogeneous and multivendor. 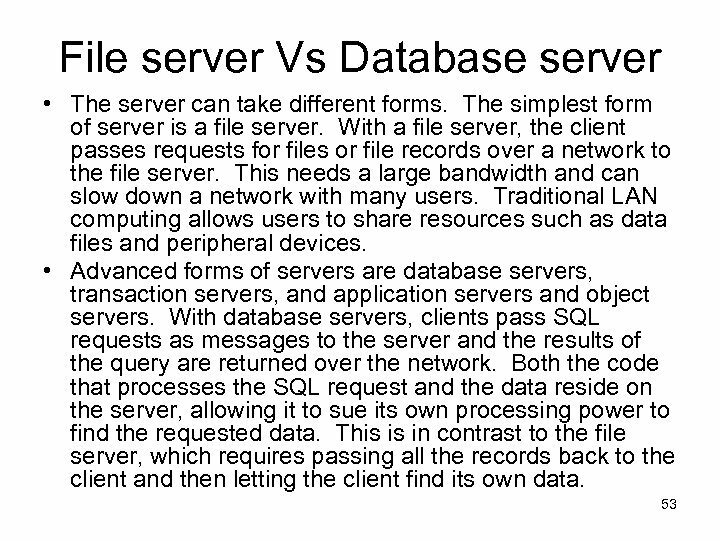 The h/w platform and o/s of client and server are not the same. 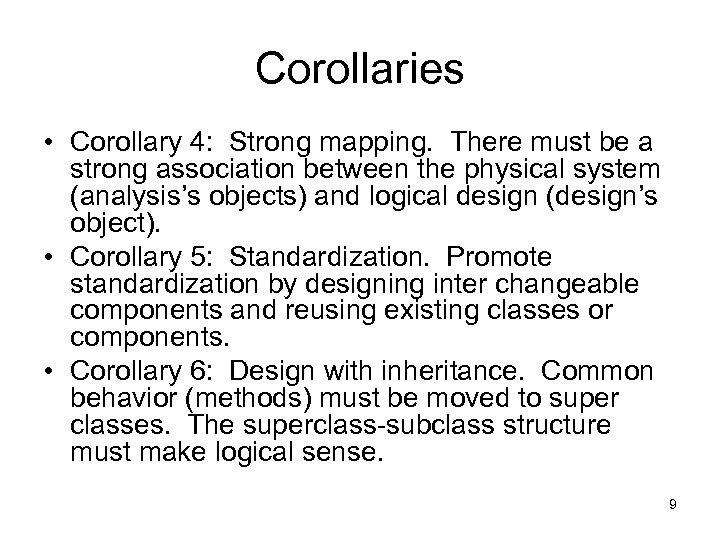 • They can be scaled horizontally and vertically. 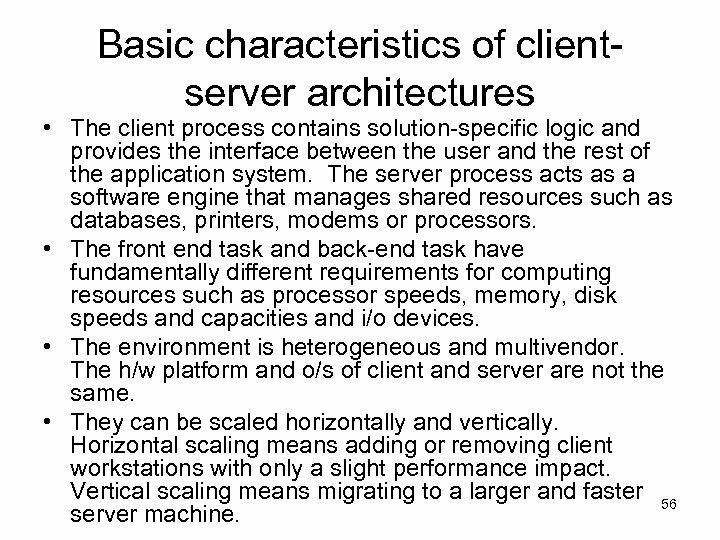 Horizontal scaling means adding or removing client workstations with only a slight performance impact. 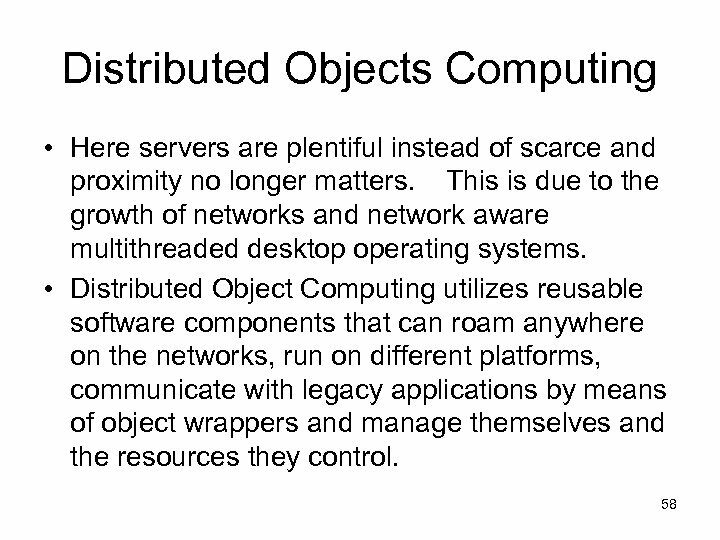 Vertical scaling means migrating to a larger and faster 56 server machine. 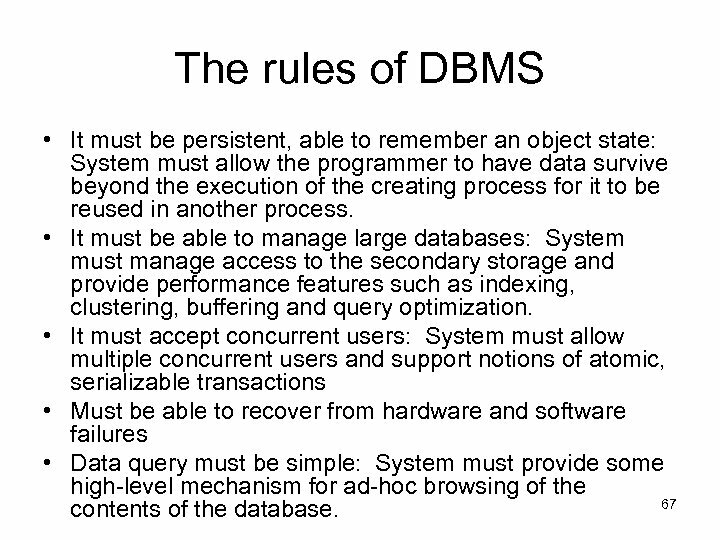 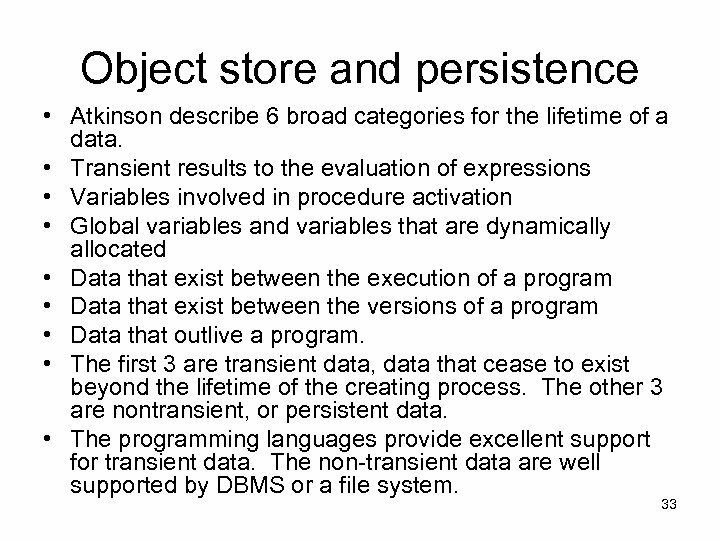 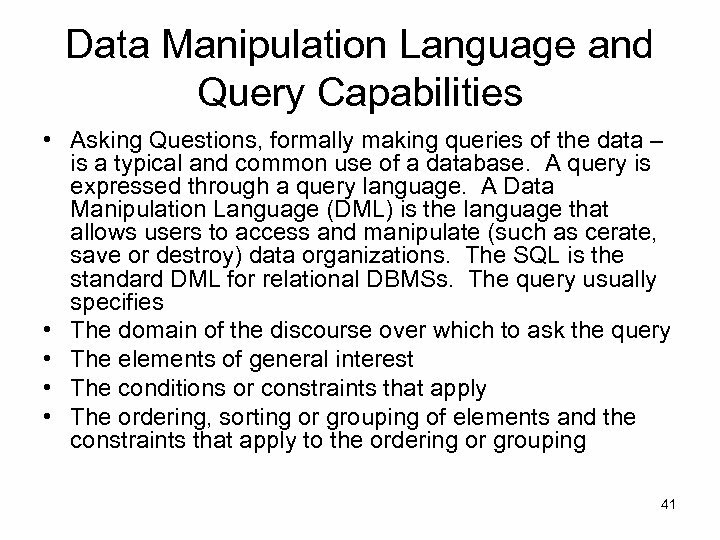 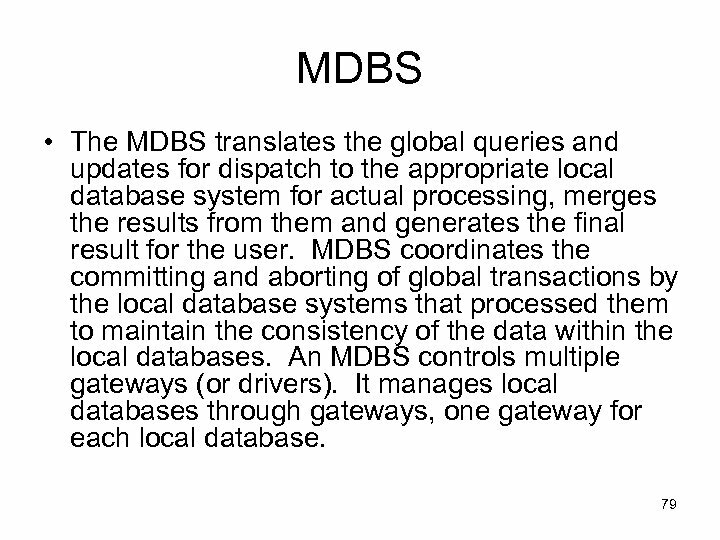 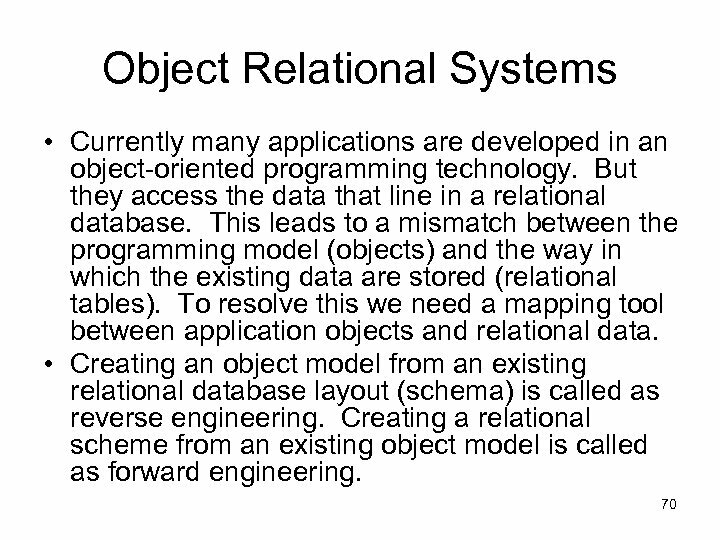 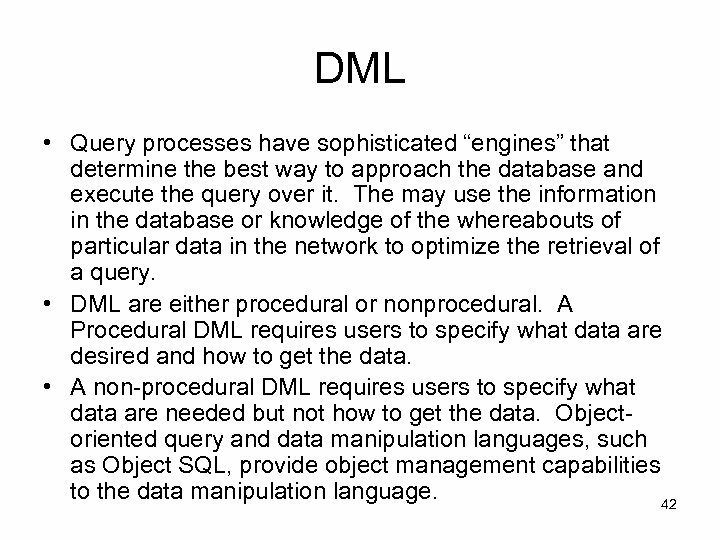 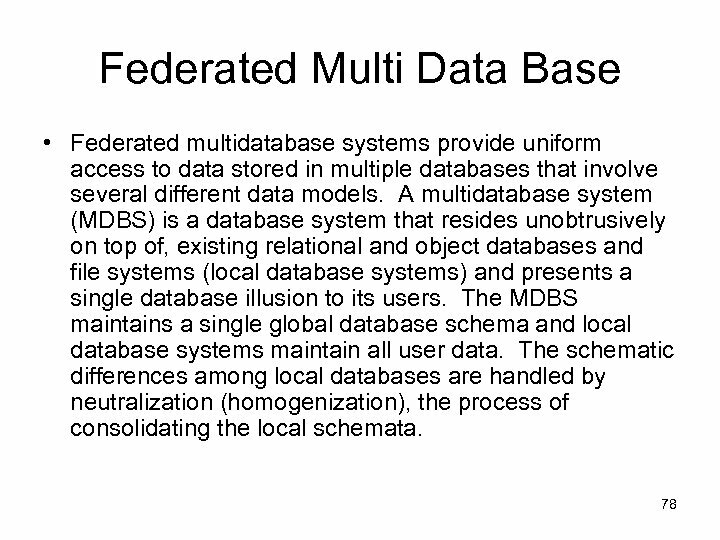 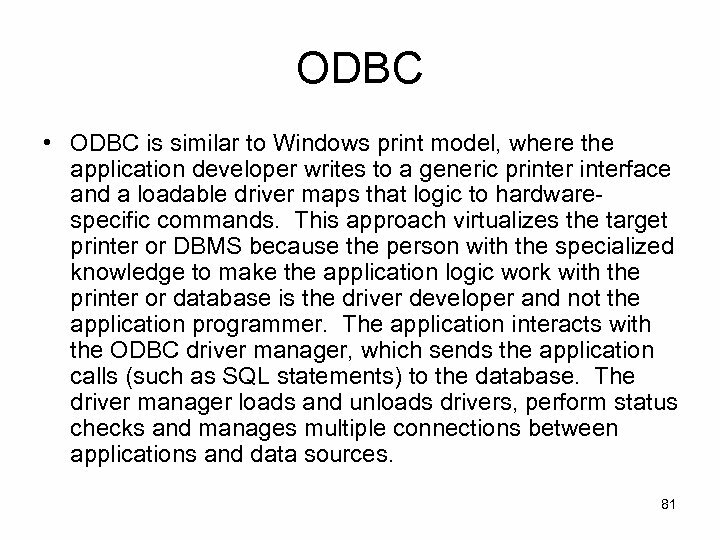 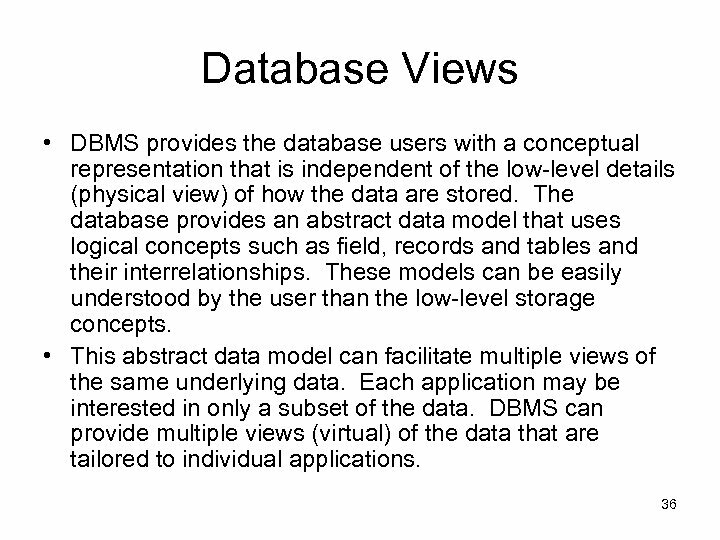 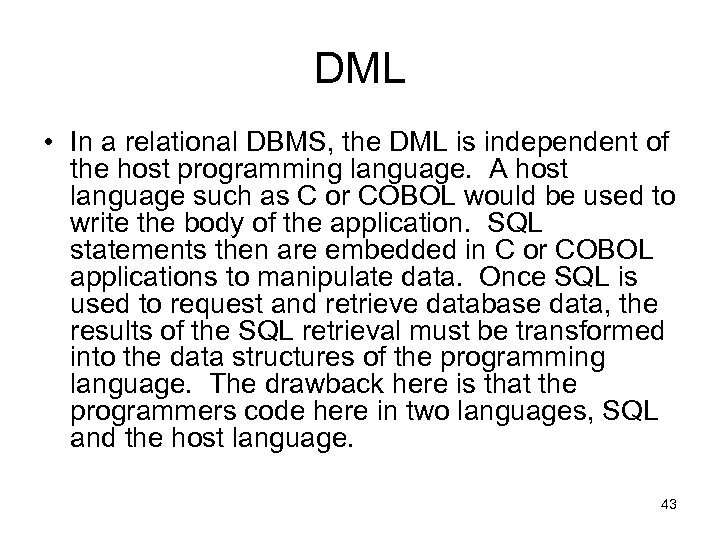 The rules of DBMS • It must be persistent, able to remember an object state: System must allow the programmer to have data survive beyond the execution of the creating process for it to be reused in another process. 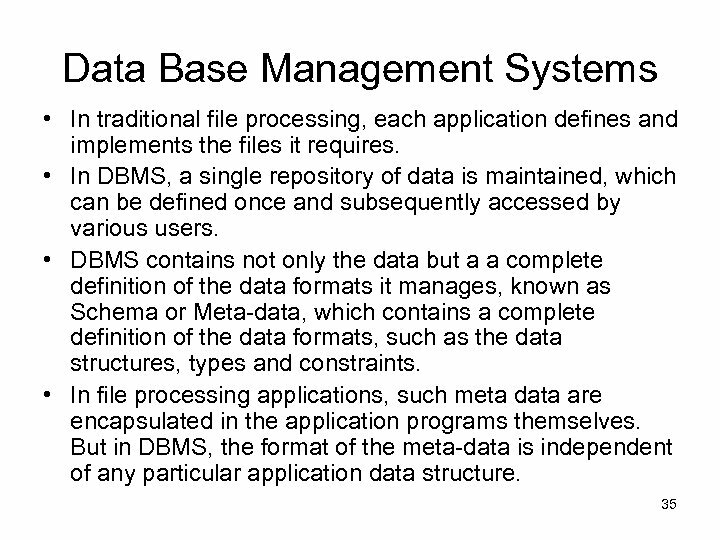 • It must be able to manage large databases: System must manage access to the secondary storage and provide performance features such as indexing, clustering, buffering and query optimization. 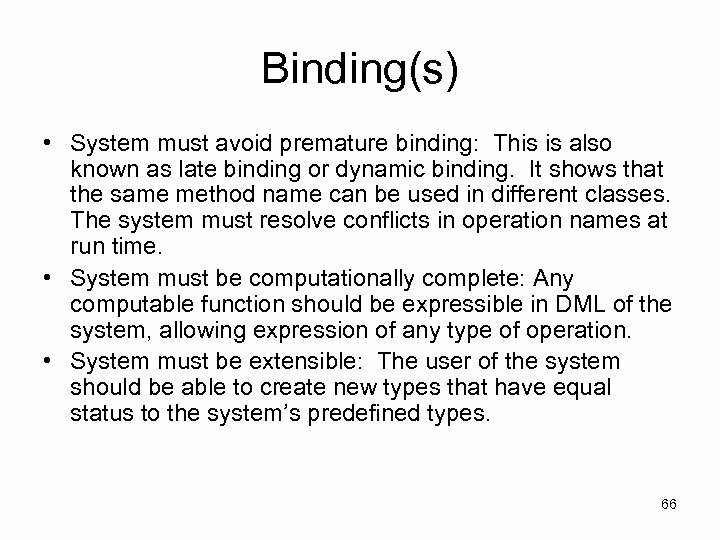 • It must accept concurrent users: System must allow multiple concurrent users and support notions of atomic, serializable transactions • Must be able to recover from hardware and software failures • Data query must be simple: System must provide some high-level mechanism for ad-hoc browsing of the 67 contents of the database.